First regional KONTAKT Conference was held in Belgrade, on March 22-24. It was organized by Marsh Creative Production and “Odličan Hrčak” concert agency. During three days 9 concerts and 6 structural panels were organized. 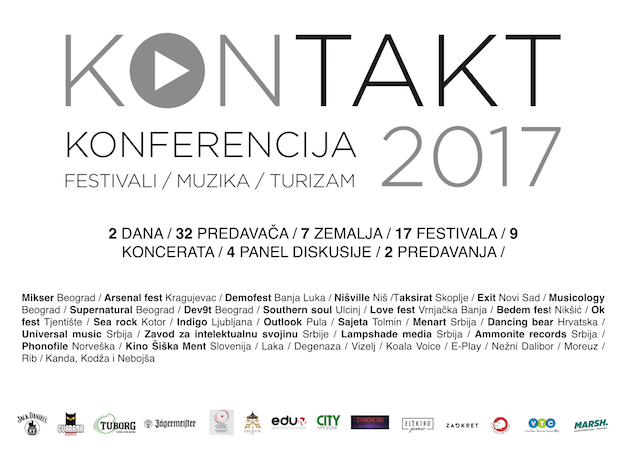 KONTAKT Conference was created out of the real need for networking between the organizers and promoters of regional music festivals, tourism associations and organizations, cultural centers, clubs, and other representatives in culture and art. The Conference arose from the need to create a clear infrastructure in the music business and to remove cultural boundaries in the region, because the music festivals are main tourist attraction of the Balkan countries, and musical tourism is becoming increasingly popular both in Europe and in the world. The representatives of the most important festivals took the participation in the KONTAKT Conference. Through examples of good practice, inspiring discussions, creative panels and public discussions, they pointed out the new trends, making an important step in mapping the region even more clearly as a very fertile ground for the development of the music industry. Among them are: Exit, Lovefest, Demofest, Indigo, Ment, Mikser festival, Arsenal, Nišville, Supernatural, Dev9t, Southern Soul, Musicology, Outlook, Bedem fest, OK fest, Sea Rock and many other leading regional tourist festival brands, as well as many bookers and music managers. The first regional KONTAKT Conference was set on a solid foundation. In its next edition, it will initiate the new topics while continuing to work on construction of music festival infrastructure, encouragement of cultural exchange and development of regional tourism.